Cute, colorful and functional. Choose from our colorful acrylic kids bath suction hooks available in two designs. Designed and produced by well-known German brand Kleine Wolke, established in 1968, and is backed by their quality guarantee. Made of durable acrylic. 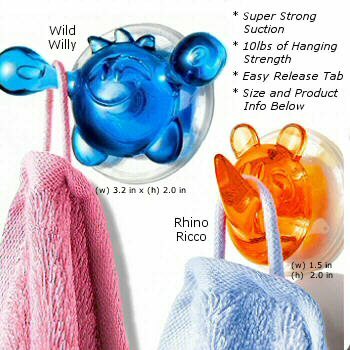 Rhino Ricco : w 1.5in x h 2.0in x d 2.0in. Do not be afraid, Ricco is very friendly and is here to help you organize your bath or shower.